As video streaming became one of the most popular ways to view video, YouTube was one of the first big websites to make streaming accessible and reliable for web surfers. It’s no wonder that they are the premier website to beat, but YouTube can’t help but be aware of the growing number of video-streaming competitors, such as Hulu, so over the past month the company has released some new features to remind users that when it comes to video streaming YouTube is the only website you’ll need. Announced at VidCon 2010, the ability to view videos in 4K illustrates the fact that YouTube really is on the cutting edge of video streaming. Back in in November 2009, the company announced that videos could be uploaded and watched in 1080p or Full HD, and less than a year later, YouTube has kicked it up a notch with 4K video. At 4096 x 2304, 4K video is roughly four times the resolution of a 1080p, which means the video will be much sharper…for the people that can actually stream it. YouTube’s blog gave a friendly reminder to reader’s that 4K video, although great, is most certainly not for everyone. The fact that the video quality will be so much clearer also means that the file “will require ultra-fast high-speed broadband connections” in order to stream them. However, if you do have a ridiculously fast connection, then by simply clicking the “Original” button under the settings tab will allow you to view any video in its intended format. As of now, it’s safe to say that most users will stick with stream their videos in 1080p since Full HD already produces a very clear picture and most consumers do not have fiber optic cable to their houses. Nevertheless, this is still exciting stuff for users, and it’s one step further in evolution of video streaming. Finally, Joshua Siegel, Production Manager, Upload and Video Mangement, announced that YouTube would finally address the “number one requested feature by our creators,” the upload limit of 10 minutes on videos. On July 27th, YouTube officially increased the upload limit from 10 minutes to 15 minutes. Siegel went on to address the fact that it has taken quite a bit of time for YouTube to expand the minute cap, but “all of the major U.S. movie studios, music labels and over 1,000 other global partners use Content ID” increasing the minute cap is finally possible. Looking through the comments, some YouTubers were upset that the increase was only in an increment of five minutes, but I would argue that five minutes is a good enough amount for now. My personal video streaming habits involve watching the World Series of Poker online, which are usually spliced into five parts because of the previous 10 minute cap. With the additional five minutes, I can now shorten the number of videos from five to three more convenient segments, but if I could shorten it down to two or even one 50 minute long video then I would be a very happy subscriber. However, it would be extremely expensive for YouTube to grow from 10 minutes to 50 minutes in such a short period of time. 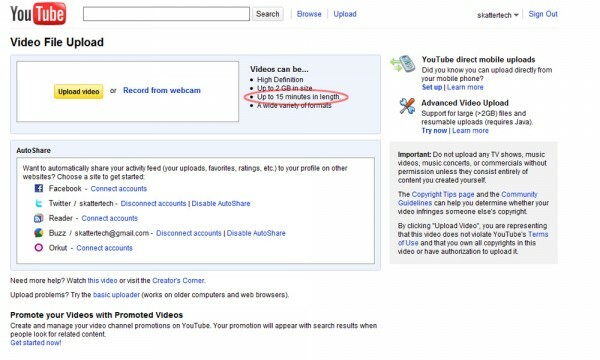 As YouTube grows and technology progresses, the time limit should be increased accordingly. I suspect that we will begin seeing an increase once every year or so in the time limit for videos.